Garnets are a group of silicate minerals that have been used since the Bronze Age as gemstones. Red garnets have a long history, but modern gem buyers can pick from a rich palette of garnet colors: greens, oranges, pinkish oranges, deeply saturated purplish reds, and even some blues. 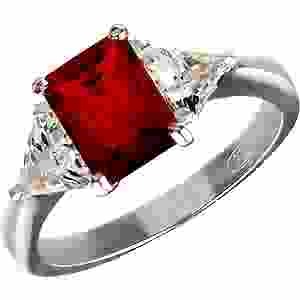 Red garnet is one of the most common and widespread of gems. But not all garnets are as abundant as the red ones. A green garnet, tsavorite, is rarer and needs rarer rock chemistries and conditions to form. Myths regarding Garnets over the centuries include the symbolism to garnet as a gift of love’s attraction, a gift of quick return or as a gift of estranged love. This myth gave partial rise to the belief that garnet is a stone for loved ones who travel and a crystal that can heal the broken bonds between lovers. NYC Wholesale Diamonds carries a full selection of Garnet and Diamond Jewelry including Rings, Bracelets, Necklaces, and Earrings. Family Birthstone Jewelry featuring Genuine Garnet Gems can be custom designed in a few days here at NYCWD, feel free to call for a quote at (212) 719-2214 *Repels flying insects. *Protects against lightning. *Is an antidote to plague and fever. *Wards off inflammatory diseases. *Helps the wearer to be firm and steadfast. *Guarantees cheerfulness if obtained lawfully. *Is a curse to those who have acquired it unlawfully. *Changes color when danger approaches. *Perpetuates friendships. *Repels flying insects. *Protects against lightning. *Is an antidote to plague and fever. *Wards off inflammatory diseases. *Helps the wearer to be firm and steadfast. *Guarantees cheerfulness if obtained lawfully. *Is a curse to those who have acquired it unlawfully. *Changes color when danger approaches. *Perpetuates friendships.